Comments: The Scottsville Cemetery, located at the corner of James River Road and Hardware Street, was originally called the Presbyterian Cemetery. It was established in 1864 when the Scottsville Presbyterian Church purchased land from Charles E. Little and devoted four of these acres to be used as a cemetery. During this time, the Presbyterian Cemetery was not used solely by the Presbyterian congregation, and citizens of various denominations were buried, there. In 1940, the Scottsville Presbyterian Church passed a resolution to transfer the land to a cemetery corporation, and in 1942 the Scottsville Cemetery Association was formed. At this point, the Presbyterian Cemetery became known as the Scottsville Cemetery. As of July 2017, the Scottsville Cemetery contained approximately 1773 gravestones as well as several unmarked graves. Directions to Scottsville Cemetery from the Scottsville Museum: Head West on Main Street and take a right onto Valley Street. Continue on Valley Street until you come to Hardware Street. Turn right onto Hardware Street and keep going straight about a half mile until you reach the cemetery, which is located on the left hand side of the road. Following is the July 2006 listing of the extant gravestones at Scottsville Cemetery as prepared by Gretchen Calcagni, an intern at Scottsville Museum from the Institute for Public History at the University of Virginia. This listing also includes the names of those, who, according to Raymon Thacker, Scottsville Cemetery manager and former Mayor Scottsville, are buried in unmarked graves. Such names are displayed in italics. In addition, the listing includes those, who are not yet buried in the cemetery, but whose names appear on gravestones. Women are listed by their married names. Also asterisks (*) that appear before names denote veterans. In 2013, Barbara Taylor and Val Schleicher sent us 540 photos of Scottsville Cemetery gravestones that were taken during their family history research trip to Scottsville. Included in their photos were many gravestones dated after 2006 when the Museum's last inventory of gravestones was compiled. 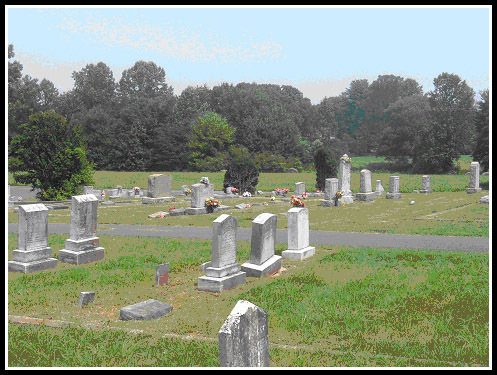 Addition of these photos by Barbara and Val to our Scottsville Cemetery webpage was completed in February 2015. In May 2017, Barbara Taylor also sent us an additional 141 gravestone photos she took at Scottsville Cemetery during her visit to Scottsville this spring. Also Cenie Re Sturm provided better images of 5 gravestones at Scottsville Cemetery in July 2017. In July 2017, Connie Geary updated the Scottsville Cemetery webpage with her photos of 200 additional gravestones that have been added to the Cemetery since 2006. As of July 14, 2017, we believe this webpage is updated, but if our readers know of additional gravestones that are not listed in this webpage, please contact Scottsville Museum at [email protected] Do let us know the full names and biographical information of the gravestones we are missing so that we may locate and photograph those gravestones. Thanks in advance for your help!. If you plan to visit one of the gravestones on this list in person, please download the attached map and numbered name index to narrow down the location of the gravestone in Scottsville Cemetery. For this 2006 map of Scottsville Cemetery, visit Scottsville Cemetery Map and Name Index. Breeden, S. T. and A. F.
Brown, Sons of W.J. and M.L. May 21, 1894-January 30. ???? Duncan, Infant Twin Sons of J.H. and Beulah W.
August 24, 1889. Also buried in this plot is Florence Maud Hunter Turner, the mother of Albert Cushman Hunter. (See her birth and death information below.). Her grave originally had a tombstone, but it no longer exists. Wife of Mr. Earl E. Lamb, Sr.
Napier, Luther Thomas "Tommy". Jr.
Pollard, Infant son of Lester H and Evelyn H.
Richardson, Infant son of E.A. and I.A. Wife of L. R. Stinson, M.D. in the 44th Year of his age. Florence is buried in the same plot as her son, Albert Cushman Hunter. Her grave originally had a tombstone, but it no longer exists. The gravestone listing of Scottsville Cemetery was compiled by Gretchen Calcagni in July 2006 as part of Scottsville Museum's ongoing effort to record local church and cemetery records.